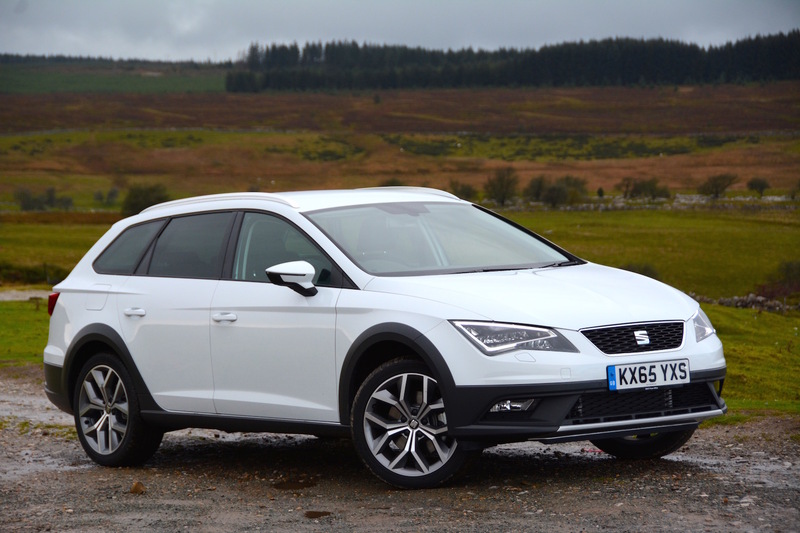 With the addition of four-wheel drive, raised ride height and off-road styling, does the SEAT Leon X-PERIENCE end up as an interesting, practical and efficient car? As increasing numbers of reviews on this website show, the big growth in consumer demand for cars is for SUVs and crossovers. SEAT hasn’t had an offer in this segment, so until a bespoke SUV arrives, the Leon has been transformed from a humble estate into an exciting crossover. Unlike a Land Rover, but like a Subaru Outback, the Leon is an estate with four-wheel drive and a raised ride height, so in theory it should offer 4×4 benefits without the bulk of a large SUV, and in the process it should be more efficient and more agile to drive . The big question is, how many people will pay £30,000 for a car from what is supposed to be an affordable brand – even if it does look more exciting in an outdoor sort of way? 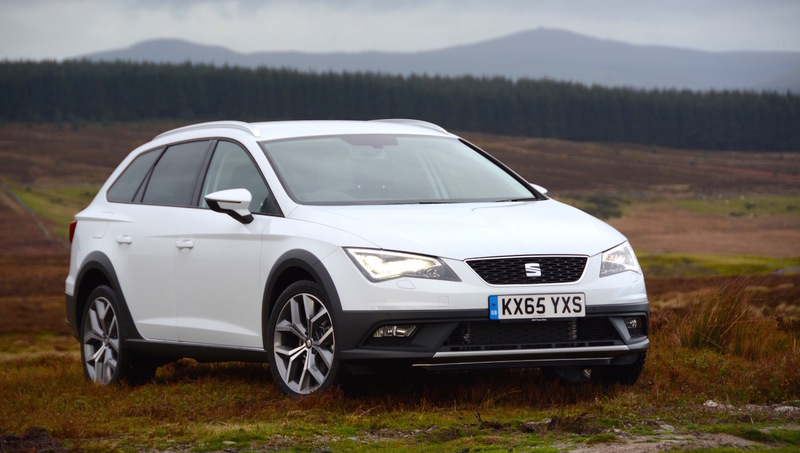 The SEAT Leon X-PERIENCE aims to create an adventurous option to the Leon model range in the same way that an Audi A4 Allroad does for the A4 range. With trimmings such as 18-inch alloy wheels, it looks more upmarket than most of the SEAT range. As you would expect, underneath the ‘rugged’ exterior is standard Volkswagen Group hardware. In the case of our test car, there’s a 2.0 TDI powertrain with 184PS, mated to a 6-speed DSG automatic transmission. There’s also four-wheel drive in the form of a ‘4Drive system’. It’s a similar story inside, with the interior being pretty much identical to the standard Leon Estate. That means it’s functional rather than creative – but it’s certainly a less basic dashboard than SEATs from a few years ago. 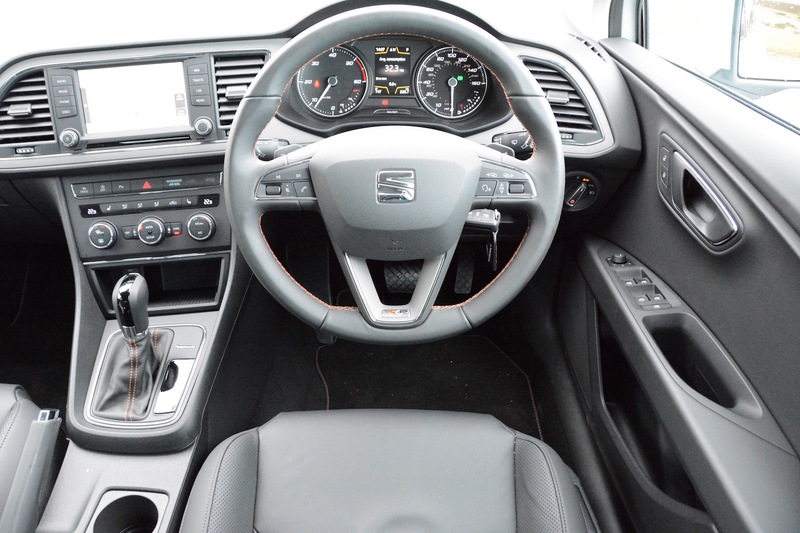 It’s also reasonably well-equipped with goodies such as heated front seats. 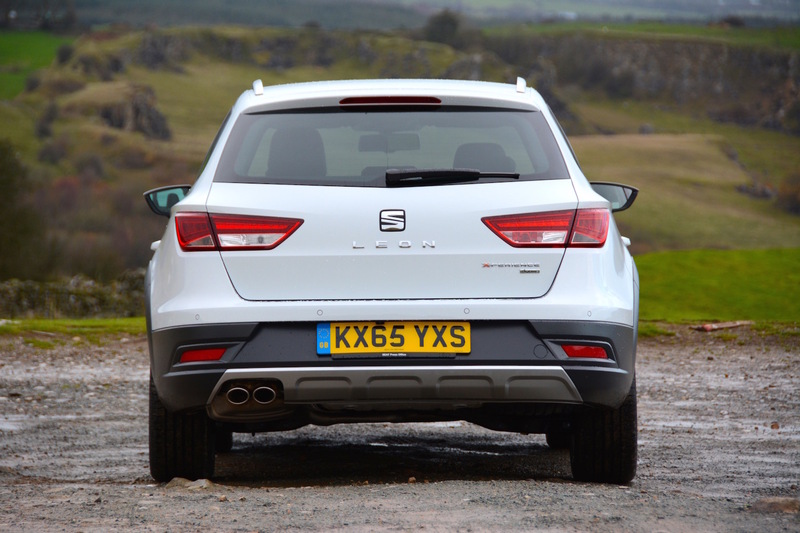 The headline here is that overall the SEAT Leon X-PERIENCE is perfectly acceptable in the driving department for most people. The driver’s seat has plenty of adjustment and can be set surprisingly low. The 184PS turbodiesel provides decent performance, and the car feels comfortable and secure, on A and B roads and motorways. Its handling is more car-like than taller crossovers and SUVs. Although the primary ride is comfortable, the secondary ride doesn’t exhibit much cushioning over poor surfaces; the 18-inch wheels won’t help in this area. When Volkswagen’s DSG transmission first appeared, we reported on it being very effective when mated with diesel engines in cars such as the Scirocco. 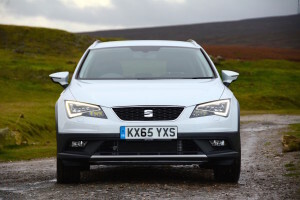 However today there are other excellent automatic transmissions (found in brands such as BMWs), and in comparison the DSG in the Leon is not always in the right gear – despite the ability to choose between settings of Drive and Sport. Drive results in gear changes at low revs; in Sport the diesel revs climb high before the car changes gear. Also the response from standstill isn’t particularly rapid in Normal, Comfort and particularly Eco modes. You can change gear manually using steering wheel-mounted paddles, but we can’t see many people doing that. DSG comes with Dynamic Chassis Control, or DCC (a manual version is available which doesn’t have DCC). So when you change driving modes – between Eco, Comfort, Normal, Sport and Individual – the damping is changed, but it’s still difficult to get the right balance between the car not being floaty in normal driving and a comfortable secondary ride. Eco mode allows coasting on downhill, off-accelerator sections. The engine re-engages quickly and smoothly, but engine braking is lost, and we’re yet to confirm how much fuel saving results from doing this rather than leaving the car in gear. To change drive modes you need to press buttons on the touchscreen, which isn’t the quickest or most convenient solution – especially when driving over bumpy roads – ie. one of the likely occasions when you might be desperate to change the drive mode setting. The same comment applies to using other infomedia on the touchscreen features such as the satnav. The X-PERIENCE has four-wheel drive in the form of a ‘4Drive system’. This is described as ‘permanently on demand all-wheel drive’. That means that most of the engine’s output is sent to the front wheels until sensors detect slip and need to send more power to the rear axle, when up to 50% of the drive can be directed there. 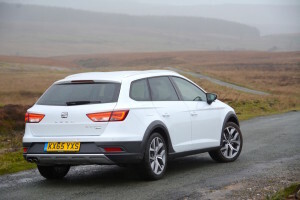 Despite being front-wheel drive most of the time, the car does have better traction on wet roads than a regular Leon. The X-PERIENCE sits on standard road tyres. This is predictable, but when we become in charge of the nation’s cars and roads, after getting rid of middle lane hoggers, we’ll make manufacturers of 4x4s with raised ride height fit tyres that stand at least a small chance of having better traction in mud and snow than the average family hatchback. In the meantime with its on-road tyres, the X-PERIENCE is capable of a mild off-roading foray such as an encounter with gently inclined grass. The fitting of all-season or winter tyres would improve the car’s all-year round traction. 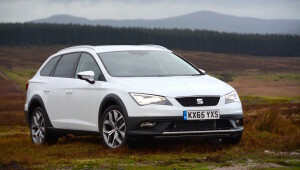 The official combined NEDC economy figure of the SEAT Leon X-PERIENCE is 57.6mpg, equating to 129g/km CO2 emissions. This is good for a 4×4, hence our desire to test the car. However after a week of mixed driving, much of it on motorways, we averaged 42.7mpg, with 39.2mpg in urban driving. So as usual, this is a fair way off the claimed average. 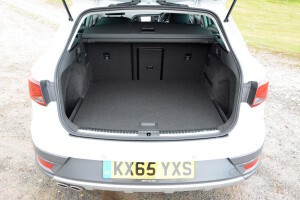 The estate body shape helps the aerodynamics compared to a bulkier SUV, but you’ve still got the raised ride height. 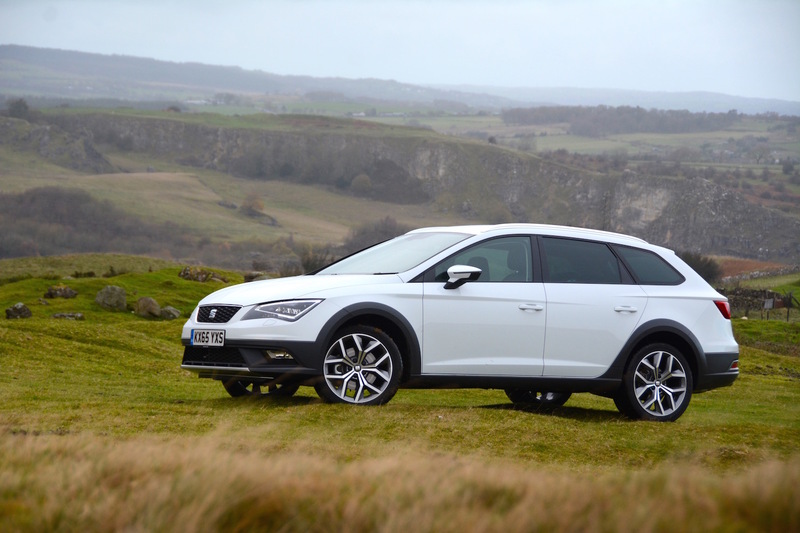 The Leon promises a driving range approaching 500 miles in real-life use. The SEAT Leon X-PERIENCE, in SE Technology 2.0 TDI 184 PS 6-speed DSG-auto form as tested, costs £29,880. 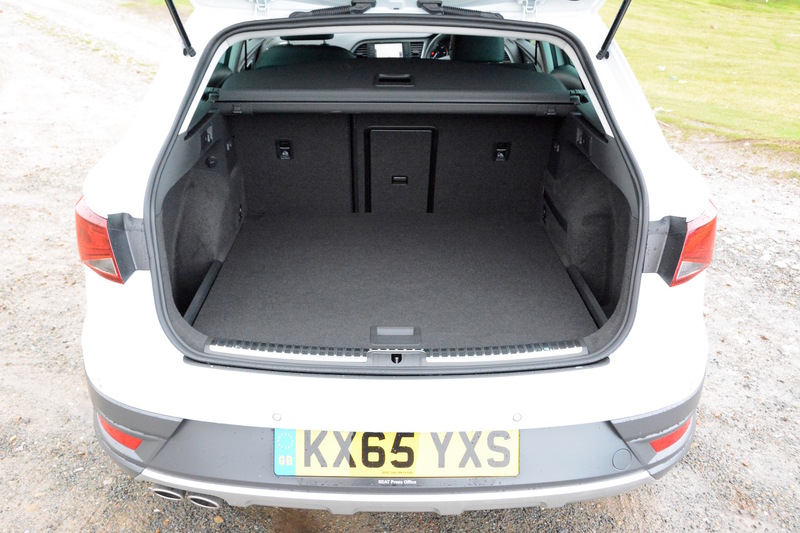 This is quite a lot for a SEAT, but it’s cheaper than an Audi A4 Allroad, which starts at around £3,000 more. Our test car had options of metallic paint (£575), the X-PERIENCE Lux Pack (£1,250), the Park Assistance Pack (£500), and Full Link (£150). 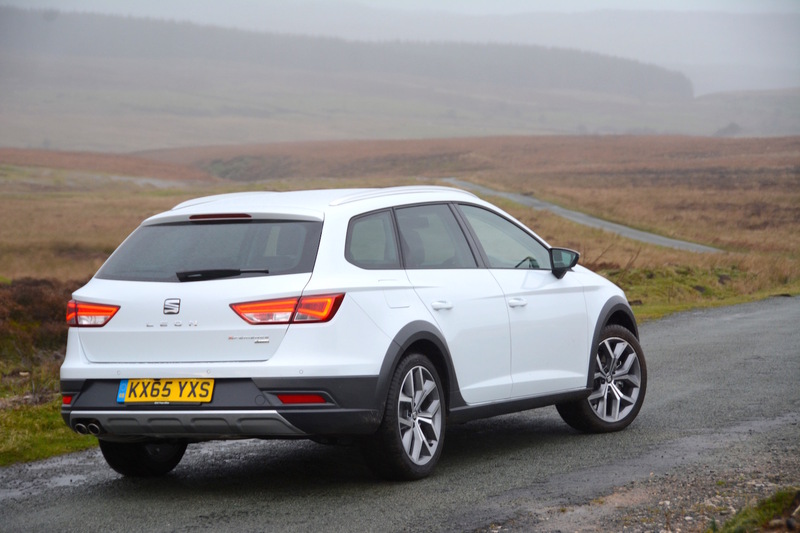 The total cost of options were £1,900, bringing the total cost for our test car to £32,355 – ie. the start of Audi A4 Allroad territory. The Leon X-PERIENCE comes in two trim levels, SE and SE Technology, and a choice of the 2.0 TDI engine in two outputs. The entry-level version is an SE 2.0 TDI 150 equipped with a six-speed manual gearbox, then there’s the SE Technology model. Or there’s our test car with the more powerful 2.0 TDI 184 PS engine and dual-clutch DSG transmission. 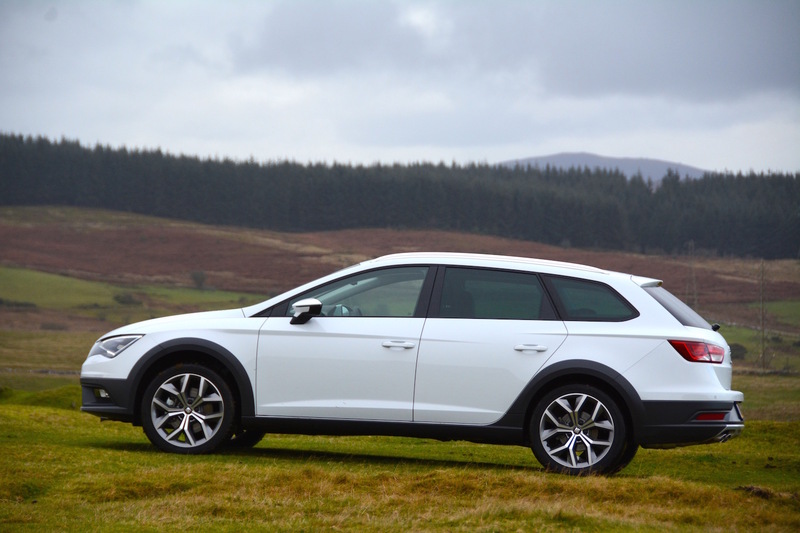 You can also buy a Leon SC (a three-door hatchback), the Leon five-door hatchback, or the Leon ST (estate). 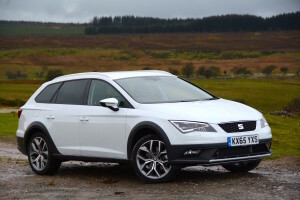 The Leon ST starts at £18,685, whereas the X-PERIENCE starts at £24,920 – that’s an extra £6,225 for the privilege of a raised ride height and ‘on-demand’ four-wheel drive. 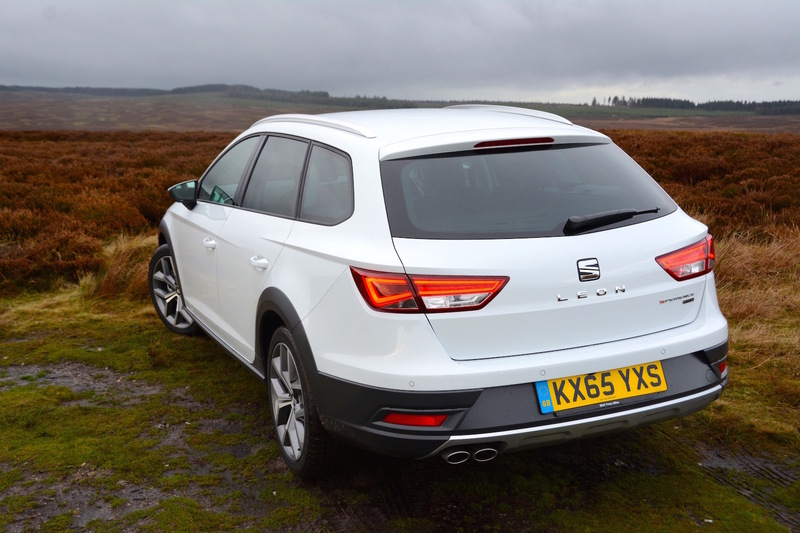 The SEAT Leon X-PERIENCE looks more interesting than a regular Leon Estate, and it’s more capable on wet roads and bumpy grass. It’s a practical car and it does most things competently. Most drivers will be perfectly happy with it. Ultimately, it’s more exciting to look at than it is to drive, as the driving experience is pretty much predictable Volkswagen Group fare. Driving the car on a motorway at night, this £30,000 vehicle could be a SEAT, a Skoda, or a Volkswagen. 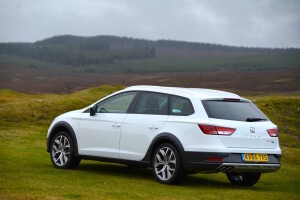 So the SEAT Leon X-PERIENCE drops a couple of marks for lack of genuine character once you’ve got past the adventurous styling, it didn’t prove to be as efficient in real-life driving as we hoped, and then of course there’s the X-PERIENCE name, which might get a little tiresome to say to people if you owned the car, but overall it gains a commendable Green Car Guide rating of 8 out of 10.